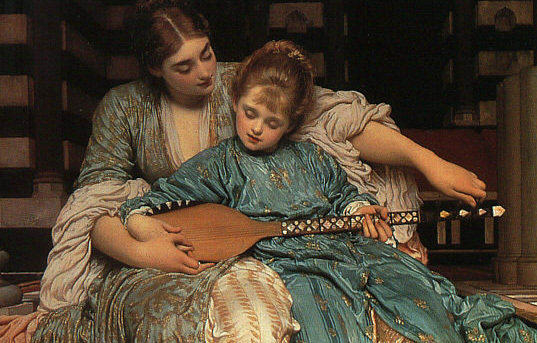 Music is life, and like life, inextinguishable. 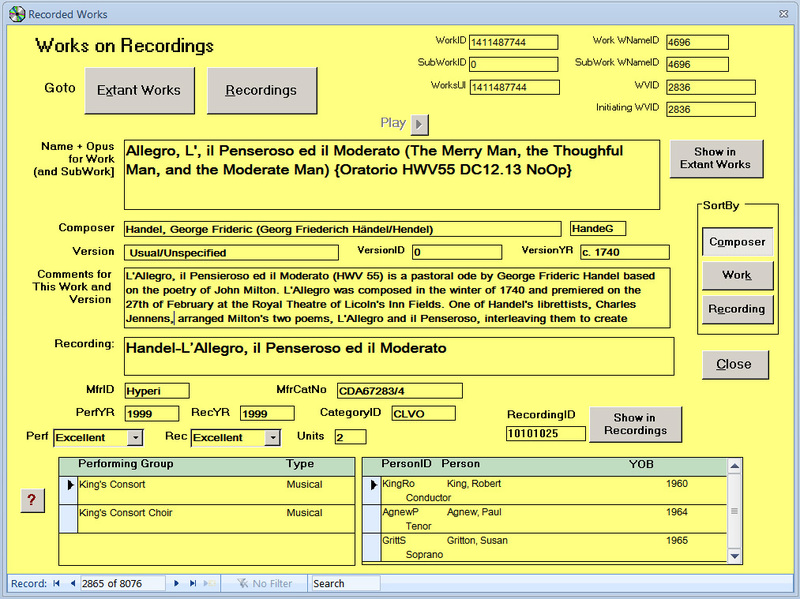 The McGoodwin Music Database (hereafter the database) is an integrated database application intended for serious music lovers, scholars, and collectors with large music collections. I have developed it gradually over many years of amateur musical interest. It is a free but copyrighted "open source" project intended for noncommercial use only. It provides a relatively large listing of the known ("extant") works of music, selected primarily from the classical repertory. There are about 11,000 works and subworks listed currently, including more than 500 operas. 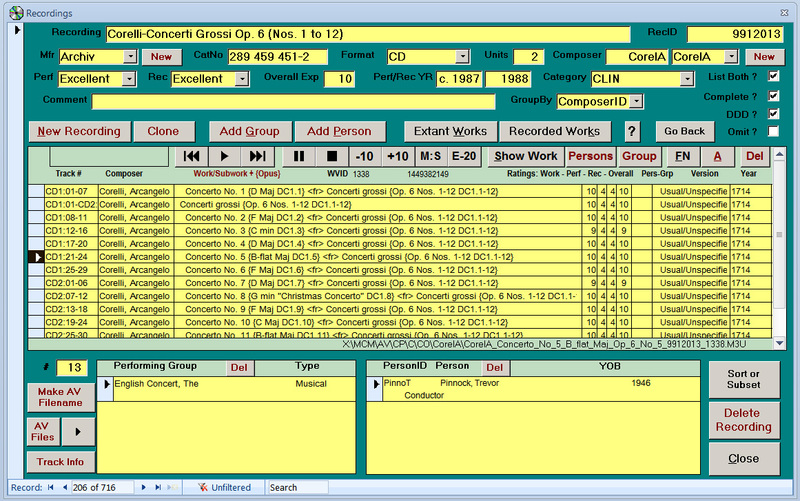 I have placed a major emphasis on accurate listing of work names such as the composer originally used, and also providing additional names and other identifying information that uniquely identify these works. The database provides a means for listing the recordings of performances which you have in your collection, or wish to keep track of. The Database includes a listing of over 700 recordings, mostly in CD format, but any format can be included. There are many features that I have included that facilitate searching for various works and recordings, whether by non-English or English names. Using filters, you may view subsets of the collection—for instance, you may confine the display of works to only the operatic extant works. I have also incorporated a mechanism in the database for storing the names of audio-visual files you possess, and for playing these files using Play buttons located on the database forms. These can be of any form as long as they are storable as computer disk files. The "Extant Works" form showing the work Vier Letzte Lieder (Four Last Songs) by Richard Strauss. Four subworks (in this case, each of the 4 songs) are explicitly included in the subworks subform. Only part of the Opus information for the subworks is displayed (the rest must be scrolled to see). The first of these songs—Frühling (Spring)—is highlighted and can be played as an AV file by pressing the Play arrowhead in the subform. Two recordings are listed as containing this complete work (Vier Letzte Lieder), and the highlighted recording (10011045) can be played by pressing the Play arrowhead in the Recordings subform at the lower left. The Search Form facilitates finding works that have complex names. The fields displayed as yellow are protected as read-only currently, but they may be readily made editable. The bottom text box provides convenient non-English characteers for copying. The "Recordings" form showing a recording having 13 line item works and/or subworks, all by Corelli, namely his Opus 6. The single overall Opus 6 work included and 11 of its 12 subworks (the individual concerti) are currently visible in the subform—the 12th of the 12 subworks has scrolled off the subform. Pressing the main form's play button (lower left) will invoke play of a playlist for the entire 2 CD recording, thus playing each of the 12 concerti grossi contained in sequence. The currently highlighted work, Concerto No. 5, has an AV playlist file whose full filepath is displayed at the lower right of the subform (ending in ".M3U"). This AV playlist file lists 4 tracks (CD1:21-24), and may be played by pressing the Play arrowhead in the subform. The various play-related buttons control the external player program Winamp. 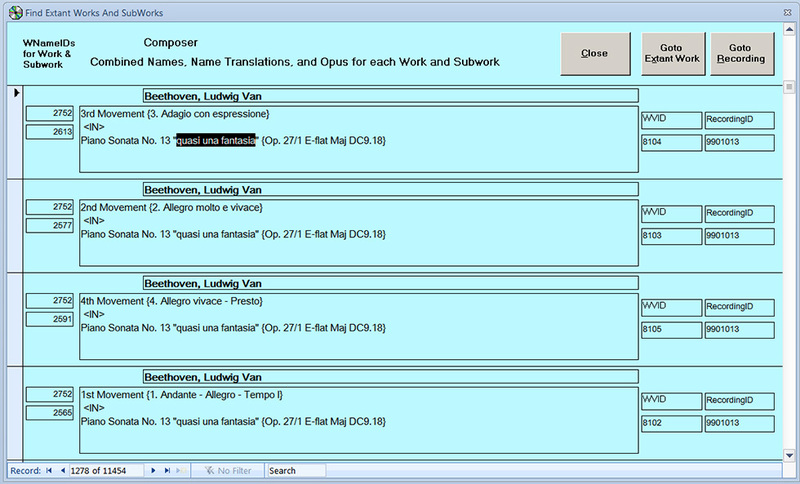 The textbox with red characters (upper left of the subform) shows that Winamp is currently playing (or is paused on) track 5 of a different subwork having 7 tracks (in this case, Concerto No. 1). Moreover, Winamp is currently positioned in this track 5 at 105 elapsed seconds, out of a total track length of 175 seconds. The "Find Extant Works And Subworks" form, evoked by pressing "Search Form" from the Works form. 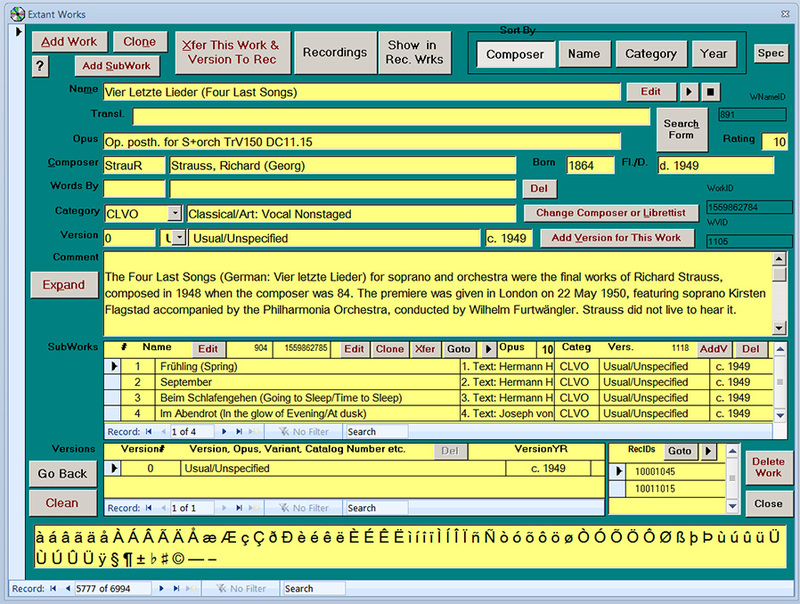 This form facilitates searching for an extant work, using the text box which combines original work name, name translation, and opus information including nicknames. Here, a work with "quasi una fantasia" in its nickname may be readily found. Version 8.8 last updated 17 May 2014. Note: This is a very large webpage.